I already have a call in to a pest control place. Of course, we didn’t find it until late on Friday afternoon… I sure wish there was some way of getting it down without poisoning the nest, but I’m sure that’s highly unlikely. It’s huge–very impressive! I hope they are at least outside! We had a HUGE bee hive in between floors, and it took a lot of research and money to remove it properly. I finally did find a bee keeper, knowledgeable, who knew exactly how to reach it with the least damage to the exterior brick wall. After that we had to leave it open to dry, had raccoons move in, and finally found a good crew of brick layers to patch it up; indeed now you can’t see any traces of the most expensive pain in the neck visitors removal ever! Oh Anna! That’s horrible! I’m so sorry to hear you had to go through that. Nightmarish! Ugh. I just discovered we have a second one on the other side of the house, dangling from a redwood branch. It’s twice the size of this one. It looks scary! I’ve had a couple of people tell me that I’m basically a bad person if I have them removed. They are beneficial, they are living harmoniously with nature… I’ve tried explaining that with my health issues, even a simple sting or two could be quite serious. I wasn’t believed. Sometimes I feel like I’m losing my mind. I really don’t understand people sometimes. At any rate, I hope the bees stay well away from the insides of your house! Agh! Be careful and con’t go near them. Thanks Anna! Indeed! I appreciate your support on the matter. 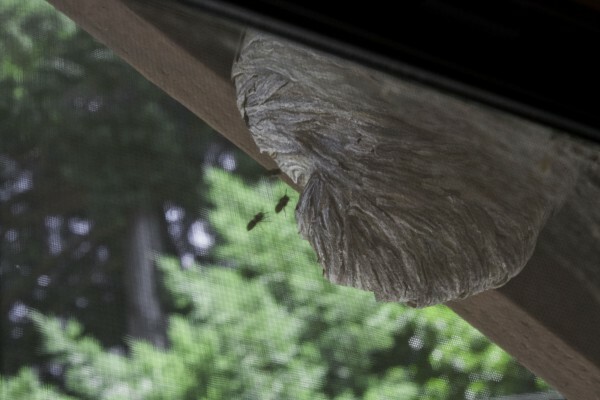 Holy CRAP, that’s a bee hive?? Lord, I really like bees and all, but this is a bit too close! Good luck!! Eek! I hope by now they are long gone. If it is a danger to you, you don’t need to feel any guilt over getting rid of the hive, even if it were bees which are having such a difficult time of it lately. 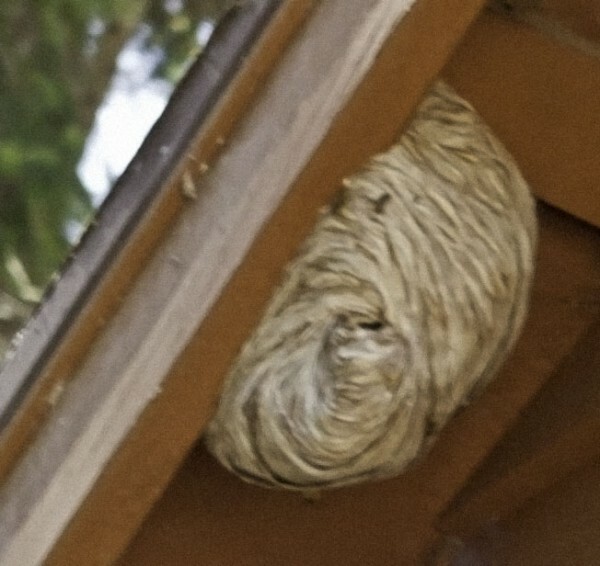 Paper wasps, on the other hand, are not suffering and you need have no compunction about killing them all. It is probably too late, and not feasible if they were sprayed, but I wonder what you could make out of a paper wasp hive? I am glad they are not bothering you :) Even better if they leave their creation to a paper artist in the fall! Well I can see I need to add your blog to my reader again! Grr! Thanks Birdie. And thanks for re-adding me. I’ve been having quite a time keeping up with everyone since the end of Reader. Theoretically, everything should’ve moved over to where I wound up, but in practice I’ve been finding blogs missing, new posts not appearing, and just general mayhem. Alas. 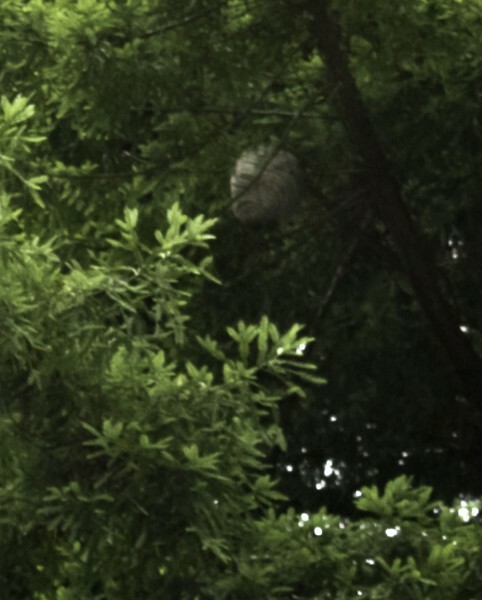 The larger of the nests, the one dangling from the tree, has already self-destructed. Big hunks of it have been falling down, and the residents seem to have moved out. I’m going to share the hunks with a nearby friend who likes to use such things in her artist’s books. The one on my studio still just… is. It hasn’t grown, and they really haven’t bothered us. However, we need to have the roof worked on before winter. Neither we nor the roofers (especially not the roofers!) want to test the little ones’ mellow and easy-going nature to such a degree, so we’re going to have to get the exterminator back out before work starts. A missed opportunity, plus a medical minute What do people post? Cute cat photos, of course.